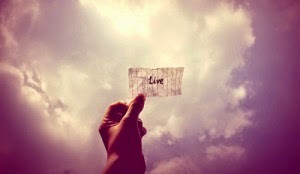 Live Up Life! : What do you learn from life? What do you learn from life? The director discovered from his CV that the youth's academic achievements were excellent. He asked, "Did you obtain any scholarships in school?" the youth answered "no".
" Was it your father who paid for your school fees?" "My father passed away when I was one year old, it was my mother who paid for my school fees.” he replied.
" Where did your mother work?" " Have you ever helped your mother wash the clothes before?" "Never, my mother always wanted me to study and read more books. Besides, my mother can wash clothes faster than me. The director said, "I have a request. When you go home today, go and clean your mother's hands, and then see me tomorrow morning. The youth cleaned his mother's hands slowly. His tear fell as he did that. It was the first time he noticed that his mother's hands were so wrinkled, and there were so many bruises in her hands. Some bruises were so painful that his mother winced when he touched it. This was the first time the youth realized that it was this pair of hands that washed the clothes everyday to enable him to pay the school fees. The bruises in the mother's hands were the price that the mother had to pay for his education, his school activities and his future. Next morning, the youth went to the director's office. The Director noticed the tears in the youth's eyes, when he asked: "Can you tell me what have you done and learned yesterday in your house?" A child, who has been protected and habitually given whatever he wanted, would develop an "entitlement mentality" and would always put himself first. He would be ignorant of his parent's efforts. If we are this kind of protective parents, are we really showing love or are we destroying our children instead?